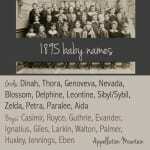 1900s baby names sounds like I could be talking about the whole of the twentieth century, or at least the first half! Not so. 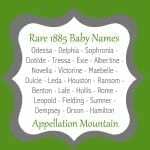 If you’ve been following the series, you know that I’m going decade-by-decade to look for the neglected gems – the baby names that have not quite been revived, even while we’ve cheerfully rediscovered other names from the same era. The data I’m using for this list can be found at the Social Security Administration’s website. I believe they call 1900 through 1909 “the 1900s,” which sounds about right to me. Many of those forty names are still in the Top 100 in the 1900s, and I’m not allowing myself any repeats! 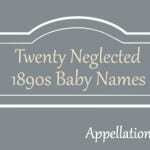 Happily, there are new entries to the lists every decade, and many of those 1900s baby names qualify as neglected gems. 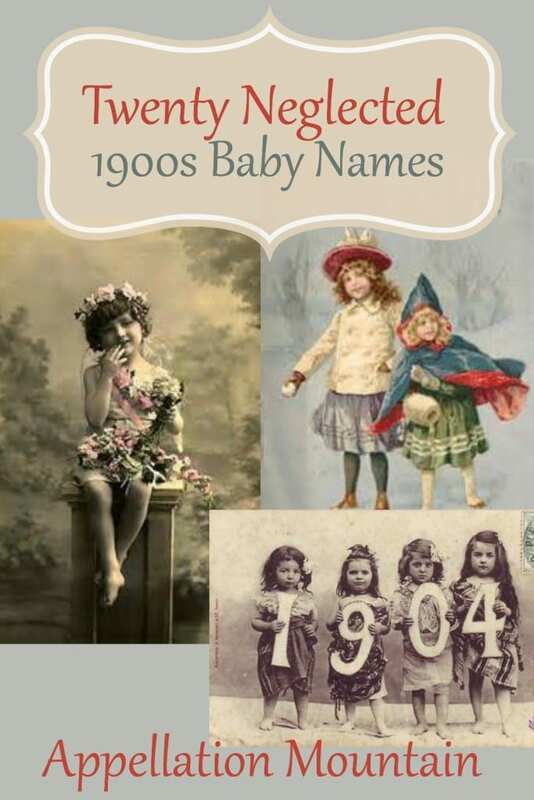 Read on for twenty 1900s baby names that we should reconsider today! Opal – Ruby is a fast favorite in 2016, and plenty of other gemstone names have seen some use. So I’m rooting for the return of many an antique gemstone name, including Pearl from the 1890s list, and this entry in the 1900s baby names collection: Opal. The gemstone comes in many colors, though I tend to think of it as a milky white with an interesting, almost rainbow-like sheen. It ultimately comes from a Sanskrit word meaning “jewel,” which might make it nicely cross-cultural, though I think it feels very much like an early twentieth century name. Another reason to imagine it could be stylish in 2016? It’s on the list of Zootopia production babies! Virginia – The letter V is big today – hello, Vivian, Evelyn, Ava, and Victoria! And place names are big, too. But while Savannah and Georgia and Brooklyn and London shine, Virginia languishes. It’s an interesting name for a daughter due around Christmas, thanks to the enduring 1897 editorial, “Yes, Virginia, There is a Santa Claus.” The name is feminine, familiar, and yet very much underused – it’s not even in the current US Top 500. Ethel – Yes, Ethel! Stay with me here. Ethel wasn’t just a popular name in days gone by. It was a Top Ten favorite for over a dozen years, and a Top 100 choice through the 1930s. That’s a very popular name, too popular to fade away. Young English singer Lily Allen is mom to Ethel Mary and Marnie Rose. And while the name has teetered on the edge of extinction in the US for years, there were 21 newborn baby Ethels in 2014, the tiniest uptick in use. Dorothy – Maybe you’re not convinced about Ethel, but odds are that you’ll agree Dorothy is overdue for revival. The storybook name re-entered the US Top 100 in 2011, and got a boost when Scarlett Johansson named her daughter Rose Dorothy. (The middle name is after Scarlett’s grandmother.) While Dorothy peaked closer to 1920, it was already heavily in use in the 1900s. I think it belongs firmly to this decade, because L. Frank Baum’s The Wonderful Wizard of Oz was first published in 1920, and became a Broadway musical in 1902. Nellie – Maybe this is cheating. Nellie was a Top 100 darling among 1900s baby names, but I think that trim, spare Nell might be the better name to put on your daughter’s birth certificate. Then again, Ellie is a well-established favorite today, so maybe it’s fair to call Nellie overlooked, too. Nellie Olsen was the mean girl in Little House on the Prairie, but that’s a fading reference in 2016. Today, Nellie feels vintage and sweet, a sister for Sadie. Vera – You know all of those V names I listed above, when talking about Virginia? The same applies for Vera! Except that while Virginia feels like a delicate name, I find Vera daring – a name I associate with an early aviatrix, or maybe a flapper. (Yes, the 1900s are too early for both of those things. What passed for daring around 1902? I’m not sure …) The name has ties to words meaning faith, but also truth, making it a meaningful choice for a daughter. Marie – Circa 1980, Marie was forever being tucked in the middle, the Rose of her day. But it wasn’t also so. Marie – the French form of Mary – entered the US Top Ten in 1894, stayed there for most of the 1900s, and ranked #8 for the decade overall. It belongs in this decade for another reason: 1903 was the year Marie Curie shared the Nobel Prize in Physics, making her the first woman to win a Nobel Prize. With French names for girls like Genevieve so in favor, how can it be that we’ve overlooked Marie? As of 2014, the name wasn’t even in the US Top 500! Betty – How can it be that Mad Men didn’t boost Betty? In fairness, Betty was going to get much more popular, reaching the Top Ten from the 1920s through the 1940s, and staying in the Top 1000 into the 1960s. Betty first entered the US Top 100 in 1903, which is why I’ve counted this one among the 1900s baby names. And, of course, an awful lot of Elizabeths probably answered to Betty in the same decades. Today, though, Betty feels as retro as Sadie, an unexpected but completely familiar name for a daughter. Lula – Pitbull made me do it. No, really. The single “El Taxi” isn’t new, but lately I’ve heard it on the radio a lot. What caught my attention? I’m fascinated by the mix of English and Spanish in Pitbull’s music – in fact, this is called “the Spanglish remix.” But it was the name that got me. The girl who won Pitbull’s – um, heart? – and boy is she a little flirty! Her name is Lula … Lula! Okay, this is no lullaby. BUT, when I spotted Lula at #78 for this decade, I thought – an overlooked vintage name for a girl that works effortlessly in English and Spanish? We should be hearing more of this name. Just 87 girls were given the name in 2014. Singer Bryan Adams named his younger daughter Lula Rosylea in 2013. Lois – I know. Lois is the mom on Family Guy, a name so mired in middle age that it’s unthinkable for a baby in 2016. But in 2013, Amy Adams took on the role of Lois Lane, girlfriend to the Man of Steel, and she’s reprising the role in the Spring 2016 Batman v. Superman: Dawn of Justice, as well as the sequel expected in 2017. We’ve overlooked Lois for years, of course – the name was used in the 1978 Superman, with Margot Kidder as the ambitious reporter; then Smallville gave us a younger version of Lois in the early part of the 2000s. But Lois entered the US Top 100 in the 1900s, and peaked in the 1920s – meaning it wasn’t quite ready for revival until now. With Amy Adams wearing the name on what seems poised to be a major blockbuster, it might be the moment for this 1900s baby name at last. Philip – How great was it a few years ago, when two pregnant characters on The Office fought over Philip as a baby name. Yes, Philip! They both used the name, too. But Philip hasn’t made a comeback. In fact, it’s currently ranked in the 300s in the US, and falling. That’s true for both the more traditional single-L Philip and double-L Phillip, the version of the name that was more popular by the 1960s. I’m a sucker for the single-L Philip, but either way it’s a neglected gem. Not sure about the nickname Phil? Another possibility is Pip, as in Great Expectations. Alvin – Before there was the singing chipmunk, Alvin was a streamlined version of many an Old English name. 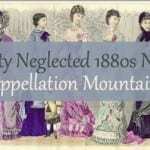 There was a fashion for such throwbacks in the nineteenth century. Perhaps it’s time for yet another round of Anglo-Saxons revivals! Alvin shares the ‘v’ of Oliver and Everett. Besides, if Max, Gus, and Hank are friendly in 2016, why not Al? And Vin certainly works for Mr. Diesel. Alvin entered the US Top 100 in 1901, and stayed there through 1938. Patrick – Confession: I’m not wild about the nickname Pat. It makes me want to add “the Bunny” every. single. time. But Patrick? It’s a handsome choice for a son, as traditional as William, as Irish as Aidan. Patrick is a Top 100 choice for 1900s baby names, but would be become even more popular later in the twentieth century. Patricia, too, peaked in the 1940s. Maybe that’s why parents are opting for Sullivan and Finn instead – we might still have a few too many Uncle Pats and Aunt Trishes to think of the Pat- names as ready for revival. But I do think Patrick is one that bears consideration. Lawrence – Larry is your accountant, or hey, your cable guy. But Lawrence? Lawrence is an adventurer! The handsome neighbor of the March girls in Little Women. A name that was in the Top 100 through the 1970s – which isn’t quite far enough in the past for Lawrence to feel fresh again in 2016. But Lawrence’s rise started in the 1900s, when the name first ranked in the Top 40 in the US – a place that the name would remain into the 1950s. Possible nickname Ren might make it more wearable for modern boys. Howard – I’ve made the case for Howard recently, and especially with non-traditional nicknames like Hoby, I think this name has potential. In fact, possibly more potential than other names on this list. Why? First, it peaked around the year 1910. That makes it a great choice for 1900s baby names, but it also means that Howard satisfies the 100 year rule. The name disappeared from the US Top 1000 for the first time in 2013, but returned in 2014. Arthur – Is it fair to call Arthur a neglected gem anymore? Camelot’s legendary king definitely belongs with the 1900s baby names. It was a steady Top 20 favorite throughout the decade. But it’s also climbing in use in 2016, gaining in use over the last few years. Some of it may be Arthur’s -r ending, which puts this name in the company of Connor and Hunter. Or maybe Arthur is just the latest traditional name to feel fresh and novel once more. Richard – On the other hand, the equally regal Richard is still in style limbo, despite being a favorite among 1900s baby names. Is it the legacy of Watergate-era president Richard Nixon? A feeling that all of the nickname options are rather dated? Or maybe it’s because Richard ranked #22 for this decade, but would eventually reach the US Top Ten – and stayed there into the 1960s. Much like Hoby for Howard and Ren for Lawrence, I suggest Hardy for Richard. Robert – Robert is an evergreen name for boys, never really out of use. But it’s definitely fallen out of fashion in recent generations. A Top Ten staple among 1900s baby names, Robert briefly reached #1 in the US, but today stands at a relatively rare #61. If your friends have all used William and Henry and James, maybe Robert is the name for you. Alfred – I made the case for Alvin earlier in this post, and the same points apply to Alfred. Call him Freddie or Al, or maybe Alfie – which remains in the UK Top Ten. And look at the numbers on this one! In 2013, there were 207 boys given the name, a tiny drop from the earlier year. But in 2014, there were 284 newborn Alfreds. It could be a fluke, but I suspect it’s a signal. If Jeremy Irons is fabulous as Alfred Pennyworth in the new Batman movies, that could be even more fuel to revive the name. Lloyd – In LEGO’s Ninjago series, one of the characters is a misfit called Lloyd. Despite starting out as a troublemaker, he turns out to be a heroic ninja, just like the more stylishly named Kai, Zane, Cole, and Jay. (Plus the lone girl ninja, Nya.) There’s also John Cusack’s teenaged Romeo in 1989 classic Say Anything … While the numbers say that Lloyd is still in style limbo, it might be the perfect pick for parents looking for the next Harvey. What’s your favorite of the 1900s baby names? Are there any that you would consider for a child? Some of my very favorite names were in the Top 100 during that decade! For a boy, Walt[er], Jack, and Hugh! For a girl, Marion, Josephine, and Viola. I like the nicknames of Hob for Robert and Law for Lawrence. And Nellie!! Yes! My great grandmother is a Nellie. Her grandmother was one as well, but she lived in Norway and spelled it the Nordic way, Nelle…but they are pronounced the same. Another grandmother is Betty. Her sister was Vivian (style mix much?). I don’t think Betty felt like her name was very substantial, but it suited her. Karl and Carl seem like they should be coming. Pixar’s UP make this very approachable. I like a lot of these – Opal, Ethel, Dorothy, Vera, Betty, Lois (love! ), Philip, Alvin, Howard, Arthur, and Alfred. Speaking of underused V names: I’m surprised Vada hasn’t spiked in recent years, especially considering its similarity to “Ava” and “Ada.” Plus, adorable Anna Chlumsky in My Girl! Maybe the funeral home/claustrophia movie themes rung too loudly? Robert and Vera are our top choices! My daughter’s new best friend at nursery is named Dorothy. There’s also a Beatrice</i. and a Karen there, so there’s definitely a retro vibe going on. I really love the name Vera, and cannot help but hear Pink Floyd’s “Vera Lynne” whenever I hear the name — but this is not a bad thing in my book!